NETWORK FINALS: OLYMPICS coverage gained 0.3 in final numbers to 3.8. Elsewhere, NFL Preseason games made for lots of changes. On ABC, the LAST MAN STANDING, DR KEN and 20/20 reruns were all down 0.2, and BOSTON EMS fell 0.3. On CBS, the final burned-off RUSH HOUR episode dropped 0.2, and 48 HOURS was down 0.1. FOX’s HOTEL HELL reruns lost 0.2. CABLE HIGHLIGHTS: Saturday cable was sports-heavy, with 8 of the Top 10 slots going to sports-related programming, although several of those were for a NASCAR rain delay on NBC Sports Net. Fox Sports 1 led the way with 0.64 for UVC PRELIMS. RIO SUMMER OLYMPICS coverage peaked with 0.41 for daytime coverage on NBC Sports Net, with USA at 0.21 and Golf Channel at 0.08. 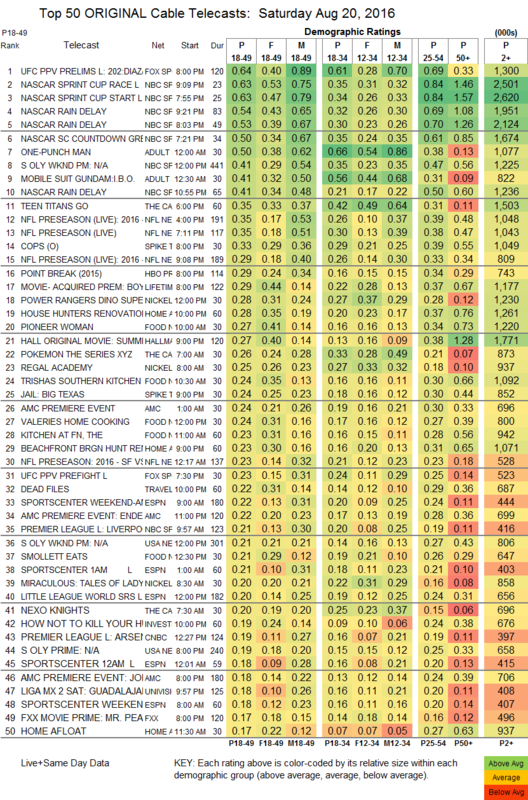 On Adult Swim, DRAGON BALL Z gained a tenth to 0.61/1.267M, ONE-PUNCH MAN was steady at 0.50, MOBILE SUIT GUNDAM held at 0.41, HUNTER X HUNTER was up 0.03 to 0.40/771K, NARUTO rose 0.06 to 0.37/706K, ONE PIECE was up 0.07 to 0.30/621K, and PARASYTE gained 0.03 to 0.24/530K. A 6PM Cartoon Network TEEN TITANS GO was just outside the Top 10 at 0.35. NFL Network’s NFL PRESEASON Giants vs. Buffalo game was at 0.35, with the late Kansas City vs. LA Rams game at 0.29. Spike’s original COPS edged up 0.02 to 0.33, and JAIL: BIG TEXAS was up 0.03 to 0.24. On the original movie front, Lifetime’s BOY IN THE ATTIC was at 0.29, and Hallmark’s SUMMER LOVE was at 0.27. HGTV’s HOUSE HUNTERS RENOVATION climbed 0.06 to 0.28. On Food Network, PIONEER WOMAN rose 0.03 to 0.27, TRISHA’S SOUTHERN KITCHEN was up 0.02 to 0.24, VALERIE’S HOME KITCHEN was at 0.24 KITCHEN AT FN held at 0.23.